YouTube Friend Adder Tubeinator is useful YouTube marketing software, you can use Youtube Friend Adder to help others find your YouTube videos and make your YouTube video more poular. Add YouTube friends, subscribe to channels and leave comments with YouTube Friend Adder Tubeinator. In the right hands, YouTube Friend Adder Tubeinator could be the edge you need to create worlwide exposure for your projects and your YouTube videos. ...... videos - it's a value you can't put a price on. In the right hands, YouTube Friend Adder Tubeinator could be the edge you need to create worlwide exposure for your projects. A good friend of mine suggested I price YouTube Friend Adder Tubeinator as a $50 "monthly membership" where you have to shell out money each and every month to use Tubeinator. And YouTube Friend Adder Tubeinator *does* have that technology embedded in it. I could easily charge $50/month for it, month in and month out, and my customers would STILL be happy with what they're getting. But I won't. Since releasing the YouTube Friend Adder Tubeinator demo for download, I've received messages from folks all over the world, asking - begging - for a way to buy YouTube Friend Adder Tubeinator. I've been introduced to people's videos that really are incredible and deserve to been seen worldwide, deserve to get the kind of buzz Tubeinator can begin to generate. Use this simple software to help others find your YouTube videos. 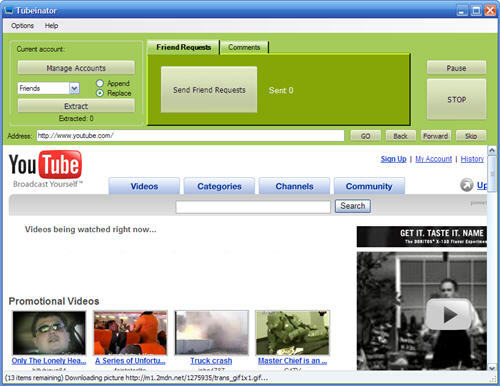 The only MySpace friend adder with full desktop functionality. Qweas is providing links to YouTube Friend Adder Tubeinator 2010 as a courtesy, and makes no representations regarding YouTube Friend Adder Tubeinator or any other applications or any information related thereto. Any questions, complaints or claims regarding this application YouTube Friend Adder Tubeinator 2010 must be directed to the appropriate software vendor. You may click the publisher link of YouTube Friend Adder Tubeinator on the top of this page to get more details about the vendor.